The small fossil is evidence that the super-continental split likely occurred more recently than scientists previously thought and that a group of reptile-like mammals that bridge the reptile and mammal transition experienced an unsuspected burst of evolution across several continents. "Based on the unlikely discovery of this near-complete fossil cranium, we now recognize a new, cosmopolitan group of early mammal relatives," said Adam Huttenlocker, lead author of the study and assistant professor of clinical integrative anatomical sciences at the Keck School of Medicine of USC. The study, published in the journal Nature on May 16, updates the understanding of how mammals evolved and dispersed across major continents during the age of dinosaurs. It suggests that the divide of the ancient landmass Pangea continued for about 15 million years later than previously thought and that mammal migration and that of their close relatives continued during the Early Cretaceous (145 to 101 million years ago). "For a long time, we thought early mammals from the Cretaceous (145 to 66 million years ago) were anatomically similar and not ecologically diverse," Huttenlocker said. "This finding by our team and others reinforce that, even before the rise of modern mammals, ancient relatives of mammals were exploring specialty niches: insectivores, herbivores, carnivores, swimmers, gliders. Basically, they were occupying a variety of niches that we see them occupy today." 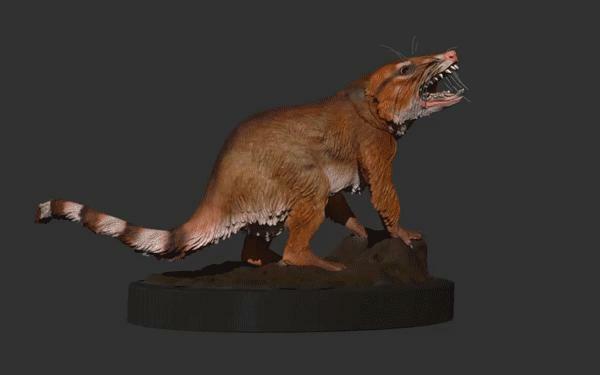 Huttenlocker and his collaborators at the Utah Geological Survey and The University of Chicago named the new species Cifelliodon wahkarmoosuch. Found in the Cretaceous beds in eastern Utah, the fossil is named in honor of famed paleontologist Richard Cifelli. The species name, "wahkarmoosuch" means "yellow cat" in the Ute tribe's language in respect of the area where it was found. "The skull of Cifelliodon is an extremely rare find in a vast fossil-bearing region of the Western Interior, where the more than 150 species of mammals and reptile-like mammal precursors are represented mostly by isolated teeth and jaws," said James Kirkland, study co-author in charge of the excavation and a Utah State paleontologist. It had teeth similar to fruit-eating bats and could nip, shear and crush. It might have incorporated plants into its diet. The newly named species had a relatively small brain and giant "olfactory bulbs" to process sense of smell. The skull had tiny eye sockets, so the animal probably did not have good eyesight or color vision. It possibly was nocturnal and depended on sense of smell to root out food, Huttenlocker said. Huttenlocker and his colleagues placed Cifelliodon within a group called Haramiyida, an extinct branch of mammal ancestors related to true mammals. The fossil was the first of its particular subgroup – Hahnodontidae – found in North America. The fossil discovery emphasizes that haramiyidans and some other vertebrate groups existed globally during the Jurassic-Cretaceous transition, meaning the corridors for migration via Pangean landmasses remained intact into the Early Cretaceous. Most of the Jurassic and Cretaceous fossils of haramiyidans are from the Triassic and Jurassic of Europe, Greenland and Asia. Hahnodontidae was previously known only from the Cretaceous of Northern Africa. It is to this group that Huttenlocker argues Cifelliodon belongs, providing evidence of migration routes between the continents that are now separated in northern and southern hemispheres. "But it's not just this group of haramiyidans," Huttenlocker said. "The connection we discovered mirrors others recognized as recently as this year based on similar Cretaceous dinosaur fossils found in Africa and Europe." David Grossnickle and Julia Schultz from the University of Chicago also contributed to the study. The specimen was found on the U.S. Department of the Interior's Bureau of Land Management lands (permit UT-EX-05-031) and is held in the public trust at the Natural History Museum of Utah, where it is on display in the museum's Past Worlds Gallery.